HOUSTON (AP) — Authorities carried out a controlled burn Sunday at a chemical plant damaged by Harvey, sending small flames and gray smoke into the sky, after saying the highly unstable compounds that had caused previous explosions needed to be neutralized. Small flames burning in charred structures were seen, with a limited amount of the smoke, from the Arkema plant in Crosby, outside Houston. Sam Mannan, a chemical safety expert at Texas A&M University, said the gray smoke indicated a more complete burn with fewer harmful chemicals remaining. By Sunday night, officials said all fires at the plant were out. Officials said the “proactive measures” to ignite six remaining trailers didn’t pose additional risks to the community. People living within a mile and a half of the site are still evacuated, and the fire marshal’s office says state, federal and local agencies will keep monitoring the air. Three trailers containing unstable compounds had previously caught fire at the plant after backup generators were engulfed by Harvey’s floodwaters, which knocked out the refrigeration necessary to keep them from degrading and igniting. Some Houston officials stressed that the recovery from Harvey was beginning, and Mayor Sylvester Turner proclaimed America’s fourth-largest city “open for business.” But the on-the-ground reality varied by place. Utility crews went door-to-door shutting off power and warning those still in some waterlogged homes in western parts of the city that still more flooding could be heading their way — not from rain but from releases of water in overtaxed reservoirs. Thousands of Houston dwellings were under new, mandatory evacuation orders, though about 300 people were thought to be refusing to leave. Some homes in the area, which included brick two-story and ranch homes with manicured lawns bordering Buffalo Bayou, remained evacuated but people briefly returned Sunday to try to salvage valuables like family photos. “I called 911 for 15 minutes; no one answered. My neighbor had a canoe and saved us,” said Gaston Kirby, who evacuated Aug. 27 with his two young children. When they left, he said, their home had about 2 inches of water and got another 2 feet from Harvey. But the reservoir releases added at least another 3 feet. Contradictions could be seen as well in some people taking a break from their cleanup efforts in the sweltering heat to worship on a “National Day of Prayer,” while others worried about thefts in storm-ravaged neighborhoods. Turner insisted, however, that much of the city was hoping to get back on track after Labor Day. Robert Lockey, a 48-year-old school district bus monitor, worked to clean up his flooded home in Spring, Texas, outside Houston, in the 94-degree heat. A pile of wooden doors lay in his yard next to ripped-out drywall. 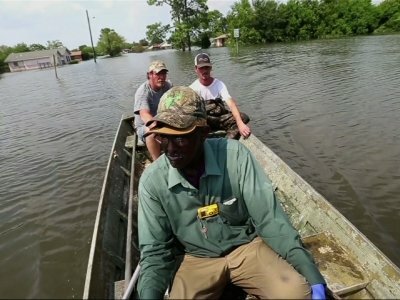 Meanwhile, repairs continued on the water treatment plant in Beaumont, about 85 miles from Houston, which failed after the swollen Neches River inundated the main intake system and backup pumps halted. In the nearby town of Vidor, Pat Lawrence and her fiancé, Jim Frasier, hopped on a tractor, the only way they could make it to services at the Pine Forest Baptist Church. Sunday was declared a day of prayer in Texas and across the nation. At St. Joseph Roman Catholic Church in the Gulf Coast city of Port Aransas, the clergy set out holy water and bug spray, and many anointed themselves with both. “We will remember the destruction of this uninvited guest but we will never stop being a people of hospitality” the Rev. Kris Bauta told about 50 worshippers. Harvey’s storm surge ended just three feet from the building. Outside the town of Liberty, about 45 miles from Houston, dozens of people were still cut off by the swollen Trinity River. Maggie King and her two children greeted a Texas National Guard helicopter that landed at the local fire department with pallets of drinking water. Weissert reported from Austin, Texas. Associated Press writers Jamie Stengle in Dallas; Kelly P. Kissel in Port Aransas, Texas; Jay Reeves in Liberty, Texas; and Johnny Clark in Vidor, Texas, contributed to this report.